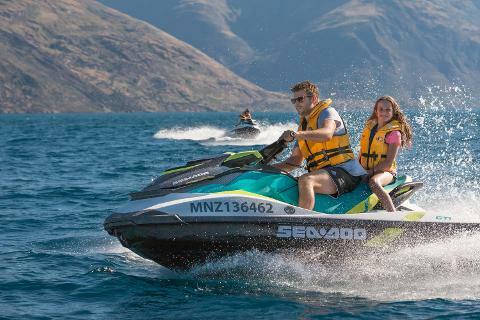 Experience the thrill of speeding across the water and discovering Lake Wakatipu’s hidden bays, wild shorelines, and stunning views on a one hour all-inclusive self drive guided jet ski tour with Jet Ski Tours Queenstown. What an incredible way to experience one of the most beautiful places in the world. 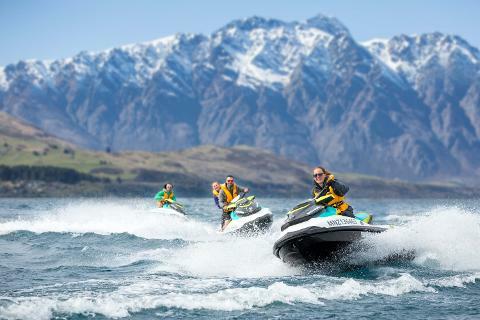 Based in Queenstown, New Zealand—the adventure capital of the world— Jet Ski Tours Queenstown is the newest exhilarating adventure activity on offer. 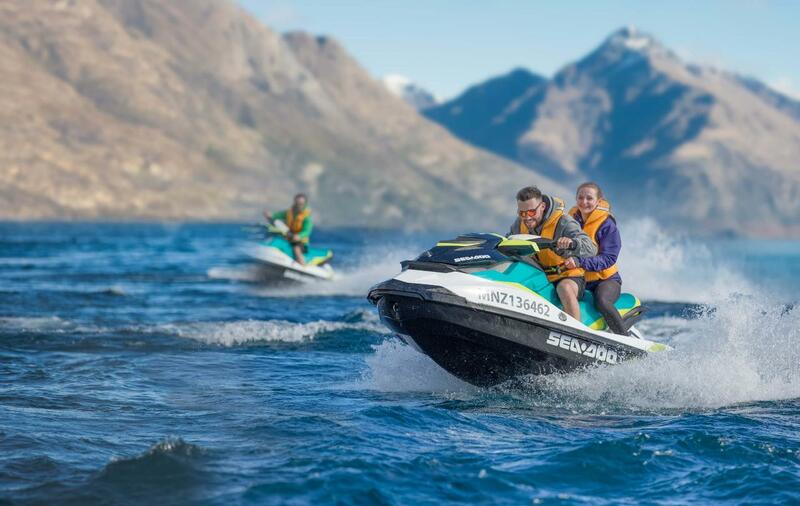 Feel the wind on your face and the blood pumping through your veins as you explore Queenstown’s natural beauty from the best vantage point –on the water riding your own latest model Seadoo jet ski. Suitable for first-time jet ski drivers or those with a bit more experience under their belt. Our experienced and friendly guides will give you all the instruction you need to feel comfortable and safe self-driving your jet ski on the water and then accompany you on their own jet ski for the duration of the trip offering advice and insider knowledge about the area. 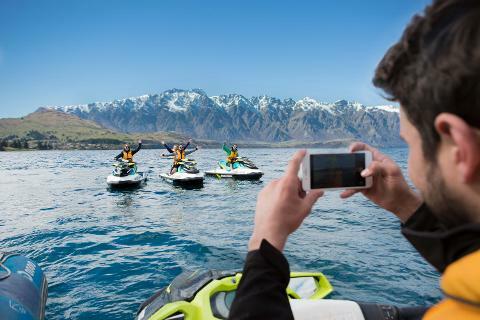 Jet Ski Tours Queenstown is the only guided jet-ski tour company departing from Queenstown Bay, located on the lakefront in central Queenstown. Each jet ski can fit up to one driver and one passenger making it an affordable and fun activity for families and groups. We keep our guide-to-client ratio low and can tailor the trip to jet ski drivers of all abilities. 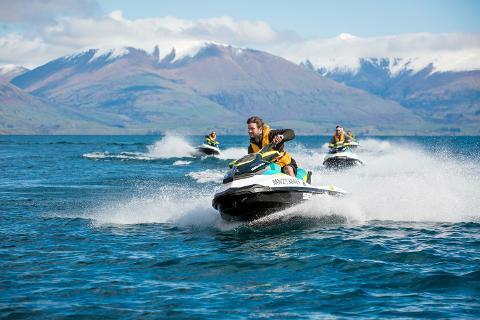 Jet Ski Tours Queenstown prides itself on having systems and procedures in place that meet, and in most cases exceed, the existing industry and official safety standards. 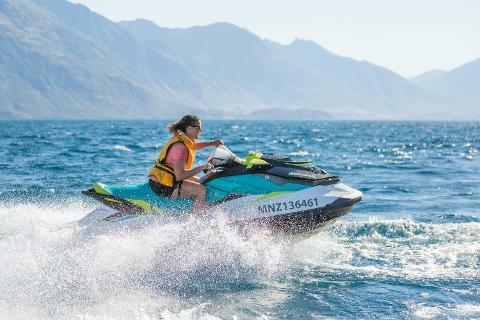 Many of our customers have never ridden a jet ski before, however after our on-shore instruction and safety briefing, on-water tuition and ongoing supervision from our qualified guide, you’ll return from your tour feeling like a jet ski pro. Trips are one hour on the water. Please allow up to two hours for the whole experience including check-in and instruction. All trips depart from the Hydro Attack wharf next to Earnslaw Park on the Queenstown Lakefront. 12.45pm daily, and 10.45am or 2.45pm on request). Availability for 5-10 people per trip. We have 4 jet skis so can take up to 4 single drivers or 4 drivers and 4 passengers per time slot. Trips can be subject to minimum numbers to confirm. The MAXIMUM combined weight for a double jet ski is 180kg combined for both driver and passenger and 110kg for the driver (due to weight transfer). This is due to increased risk of flipping the jet skis with two people. The MAXIMUM weight for a single jet ski with a driver only is 120kg. The recommended age for children to ride as passengers is 8 years and above. Please speak to our team before booking if you have children under this age. A Parent or Legal Guardian must complete a waiver form for all children 17 years and under riding as passengers. Customers need to understand basic English. Lifejackets are provided but customers must be comfortable floating in a lifejacket in the water to go on this trip. You don’t require a jet ski licence or drivers licence for this tour. PLEASE NOTE: Our jet ski tours are subject to a minimum of 2 jet skis to confirm a tour and are subject to weather conditions on the lake. Please call us on 0508 493 762 TWO HOURS before your trip departures to check your trip is confirmed and the weather conditions are good.